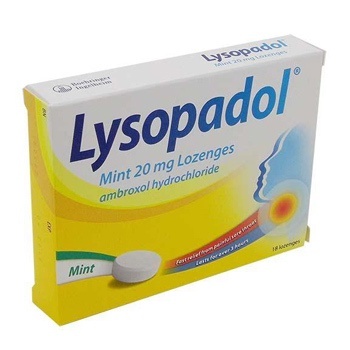 Lysopadol Lozenges for fast relief from sore throats. Fast relief from sore throats lasting over 3 hours. Contains Ambroxol Hydrochloride, an ingredient proven to relieve pain and redness in sore throat with its local anaesthetic and anti-inflammatory properties. Ingredients: Ambroxol Hydrochloride, Sorbitol (E420), Peppermint aroma (gum arabic, peppermint oil, maltodextrin, lactose monohydrate), saccharin sodium, macrogol 6000 and talc. Adults and children over 12: One lozenge should be sucked when needed and up to a maximum of 6 per day. Not recommended in children under 12. Do not use if pregnant or breast-feeding or sensitive to any of the ingredients or fructose intolerant.